Dr Mahathir Mohamad himself addressed concerns of markets yesterday when he said the economy and finance will be the new government's main focus. THE "Mahathir factor" that snagged the opposition party an extraordinary victory in Malaysia's 14th general election will trigger a knee-jerk reaction from investors, but as the dust settles in coming weeks, financial markets could come to recognise the potential positive impact of change while acknowledging the risks. Independent economist P K Basu said: "It's the silliness of financial markets. They hate uncertainty, change. So the market and the ringgit are likely to sell off quite precipitously as they digest the new uncertainty caused by the first change of governing party in 61 years. "But this is an enormous political earthquake led by one of the most experienced, not untested, teams. The sell-off is a buying opportunity. "Malaysia will benefit from a renewed social contract among the races that allows heightened capital inflows from long-alienated business groups (many of them Malaysian-Chinese) who were close to Anwar (Ibrahim) and Mahathir (Mohamad)," said Mr Basu, who wrote Asia Reborn and who in April correctly predicted a slim majority win by the opposition coalition Pakatan Harapan (PH) led by Dr Mahathir, Malaysia's newly-installed seventh Prime Minister. "We would like to tell the business people that they can now push up prices in stock market. "There should be no cause for the devaluation of the ringgit. We cannot revalue the ringgit too much or we cannot be competitive," adding that "we will try to make it as reasonable". Much of the short-term volatility in ringgit-denominated assets could be a result of the market's misplaced complacency that the long-ruling Barisan Nasional led by Najib Razak would secure a smooth win at the ballot box, hence ensuring political and economic continuity. Such expectations were severely upended with PH's stunning victory, which put Dr Mahathir, 92, back in the saddle - after his stint governing Malaysia for more than two decades until 2003 - but this time, he takes the helm as the world's oldest elected leader. Aninda Mitra, senior sovereign analyst at BNY Mellon Investment Management, said: "I think there will be short-term volatility. It is a significant course correction following the corruption under Najib." The ringgit, which has lost over 2 per cent of its value against the US dollar since early April on political noise and the strengthening US dollar against other Asian currencies, reacted predictably on Thursday. It slipped to RM4.046 against the greenback from RM3.94 to the US dollar pre-election. Against the Singapore dollar, the Malaysian currency fell to 2.9475. 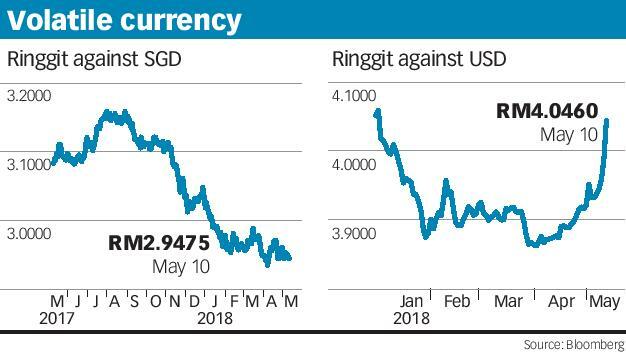 A weakening ringgit against the US dollar could hurt the Singapore dollar as the ringgit makes up some 12 per cent of the Sing dollar's trade-weighted basket of currencies, said UBS Global Wealth Management regional chief investment officer Kelvin Tay. The lingering near-term uncertainties has led currency experts to tweak year-end predictions for the ringgit from around 3.80 to 4.00-4.05 against the greenback. Malaysian government bonds could be vulnerable too, given high foreign ownership of some 45 per cent. As for Malaysian equities, market watchers would have to wait till next Monday, as Bursa Malaysia is shut on Thursday and Friday. Analysts expect some volatility - if Thursday's showing of some Singapore-listed stocks with significant Malaysian exposure is anything to go by. Hatten Land lost 0.6 per cent; Top Glove Corp slipped 0.9 per cent, while Health Management International registered the steepest loss of 3.7 per cent. Not all were in the red though. Other companies that earn a bulk of their revenue from Malaysia, such as GSH Corp, Riverstone Holdings and Silverlake Axis rose 1 per cent, 2.6 per cent and 0.9 per cent respectively, outperforming the key Straits Times Index which fell 0.3 per cent on Thursday. Asia's largest private healthcare operator IHH Healthcare and Samurai 2K Aerosol closed unchanged. The hope-inducing big picture however, may not be lost on foreign investors. Morgan Stanley wrote in a research note: "We cannot rule out that this (the surprise election result) raises the interest level for foreign investors anticipating change." Foreign investors may also eventually embrace the election outcome as a sign of rising political maturity and respect for democracy that could raise the country's appeal and economic prospects, said Aberdeen Standard Investments Malaysia chief executive Gerald Ambrose. The Malaysian economy has been doing well and local financial markets have been outperforming their emerging market counterparts since last year. ING's Asia economist Prakash Sakpal said: "The sustainability of these trends hinges on the continuity of current economic policies under the new administration." Dr Mahathir has largely proven himself to be a pragmatic leader and Mr Anwar - the country's former deputy Prime Minister and Finance Minister - who will be released from prison in June and is expected to succeed him in two years, is well regarded for backing market-friendly policies. Yet, there are key issues that require urgent clarity such as PH's pledge to scrap the goods and services tax (GST) and return fuel subsidies. The implementation of GST and dismantling of subsidies by Mr Najib's government were frowned upon by the citizens, who were already grappling with rising cost of living, but lauded by economists for being a sign of a commitment to fiscal reforms. The concern is how Malaysia will plug the fiscal hole when these are unravelled. UBS' Mr Tay said: "This is not insignificant. By one estimate, Malaysia's government deficit for 2017 would have been closer to 5 per cent (instead of 3 per cent) without the incremental GST revenue." Recovering oil prices and restoring the sales tax plus bolstering revenue through other means, say others, may help offset the potential loss of revenue. The other uncertainty is the fate of big projects such as the KL-Singapore high-speed railway; Dr Mahathir had said last year that it wasn't a done deal, even though he was personally quite a fan of mega infrastructure projects back in the day. Also, over the past two decades, many prominent Malaysian entrepreneurs - some of the wealthiest in the country and Asia - had cut their investments at home and expanded big time abroad. These businessmen were closely associated with Dr Mahathir and Mr Anwar, so the leadership change could draw their money back to base in a "much more fundamental way", said Mr Basu. "This, plus the new social contract could fundamentally change the economic and growth prospects of the country for the better. Is this a positive thing? You bet it is."